LHC Report: Freshly squeezed beams! The TOTEM experiment at the LHC has just confirmed that, at high energy, protons behave as if they were becoming larger. In more technical terms, their total cross-section – a parameter linked to the proton-proton interaction probability – increases with energy. This phenomenon, expected from previous measurements performed at much lower energy, has now been confirmed for the first time at the LHC’s unprecedented energy. One arm of a TOTEM T2 detector during its installation at interaction point 5. A composite particle like the proton is a complex system that in no way resembles a static Lego construction: sub-components move inside and interactions keep the whole thing together, but in a very dynamic way. This partly explains why even the very common proton can still be hiding secrets about its nature, decades after its discovery. One way of studying the inner properties of protons is to observe how they interact with each other, which, in technical terms, implies calculating the total cross-section of the proton-proton interactions. Early measurements at the CERN ISR surprisingly showed that the cross-section increases when the energy increases. This was then confirmed by the CERN SppS Collider and the Tevatron. But this is the first time that the trend has been confirmed at the highest energy, that of the LHC. 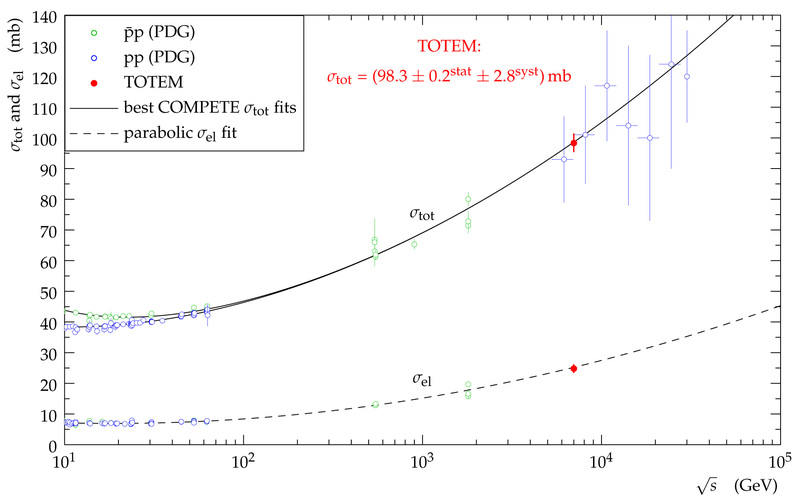 “TOTEM’s result of (98 ± 3) mbarn for the total cross-section confirms that, even at the so far unexplored energy of the LHC, the proton behaves as if it were becoming larger,” says Karsten Eggert, spokesperson of the TOTEM collaboration. TOTEM measurement of the total cross-section of the proton at the 7 TeV centre-of-mass energy: 98 ± 3 mbarn. Measuring the proton-proton total cross-section is not a trivial exercise. “We requested a special run of the LHC,” explains Eggert. “The beam divergence in the proximity of the interaction points in the machine had to be much smaller than in standard LHC operation. In only thirty minutes of data taking with this special beam configuration, TOTEM collected sufficient data to measure the elastic proton-proton scattering cross-section, which made it possible to determine the total cross-section using the so-called optical theorem." The present calculation is based on the luminosity measurement provided by the CMS experiment, but the collaboration’s future plans involve using only TOTEM’s detectors to measure it in a luminosity-independent way. “Rather soon we will have a longer specialised run and move our detectors closer to the beams,” says Eggert. 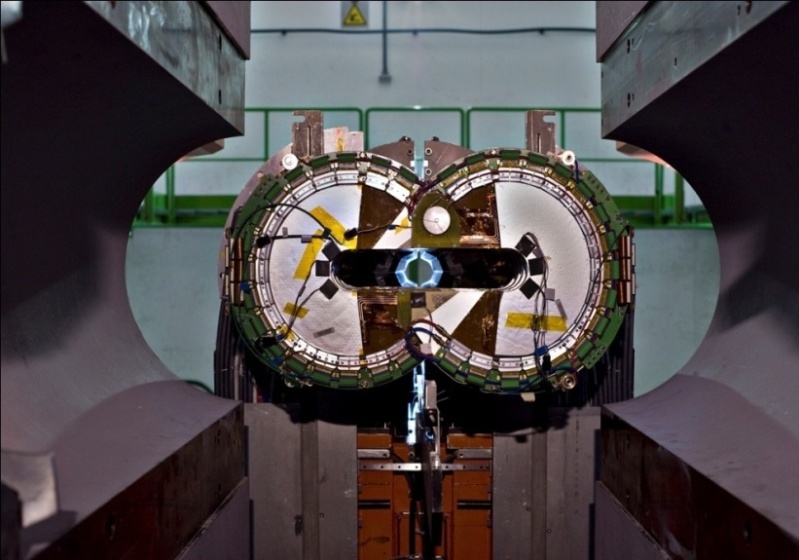 TOTEM’s new result will significantly contribute to a deeper understanding of the nature of the proton. From theory, we know that there is a limit to how large the proton can become if pushed to the highest energies. “For the time being, our results are beautifully in agreement with data coming from cosmic rays and extrapolations made from previous measurements. This result represents the first experimental confirmation of long-standing guesses that physicists made about the proton’s behaviour at high-energy,” concludes Eggert.